2014–15 saw the largest ever delivery of environmental water to Gunbower Forest. Four sites in Victoria have been identified as 'icon sites' for restoration. These sites include Hattah Lakes, Lindsay-Wallpolla Islands (including Mulcra Island), Barmah Forest and Gunbower Forest. Between May and December 2014, 98,000 ML was delivered through the forest, made possible with the Hipwell Road Channel works. Around 37,000 ML of this water remained in Gunbower, inundating 3,800 hectares of the forest, filling wetlands and flowing across vast areas of river red gum floodplain. Anna Parker, Gunbower Forest Project Manager with the North Central Catchment Management Authority, said the ecological response to this historic watering event was unmistakable. "The footprint of the flooding in the forest is very clear. There is fresh new growth on the river red gums, and lush tall sedges across much of the forest floor, even after summer, creating important habitat for ground-dwelling animals," Anna said. 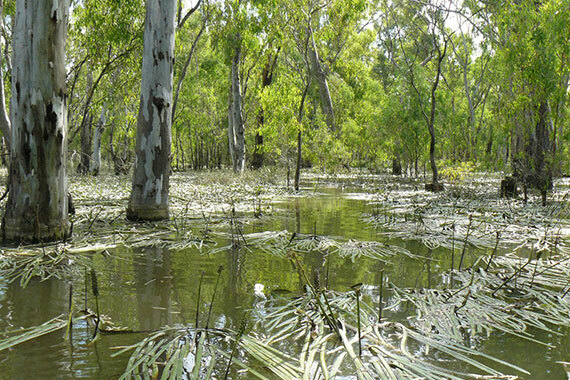 "Ecological monitoring clearly shows a higher diversity of native vegetation in areas of the river red gum forest that were flooded, including a good cover of aquatic, amphibious and mudflat species." "In the wetland sites, five rare and threatened plant species were also observed, including large and dense swards of the vulnerable river swamp wallaby grass." Another important aim of the environmental watering was to enable movement of native fish between Gunbower Forest and Gunbower Creek, so fish could take advantage of the productive floodplain. "Native fish also clearly responded well to the environmental watering," Anna said. "In a two-hour sample, approximately 14,000 fish moved through the fish lock on Gunbower Creek, including 8,000 Australian smelt and 6,000 carp gudgeons." Winter flows were also delivered through Gunbower Creek to maintain connectivity and habitat to help native fish such as golden perch and Murray cod survive the winter period. "During winter, while there is no irrigation demand, there is no flow in Gunbower Creek and these winter conditions are stressful for native fish," Anna said. "Environmental watering in the creek during winter is aimed at increasing the survival of fish, especially juvenile fish."